A custom that proves the deep religious faith of Tinians is the lighting of Vigil Lights. It is an unwritten law, binding the locals to light all the country chapels this way every Saturday afternoon and on the eve of the celebration of a Saint’s memory. Every chapel has a permanent or temporary owner, responsible for keeping the custom. Non-fulfillment of this obligation is considered a moral offence not tolerated by the locals. This custom sometimes takes the form of a solemn religious promise. Thus, many Tinians often as a token of gratitude, supplication or thanks to a Saint, vow to go to the chapel dedicated to the Saint’s name. The pilgrims arrive at the chapel early in the morning. If the oil lamps are already lit, they add some oil to keep them burning and they leave the oil bottle they brought with them next to the candelabrum so it can be used later. In every case, the ritual includes candle lighting and incense burning. 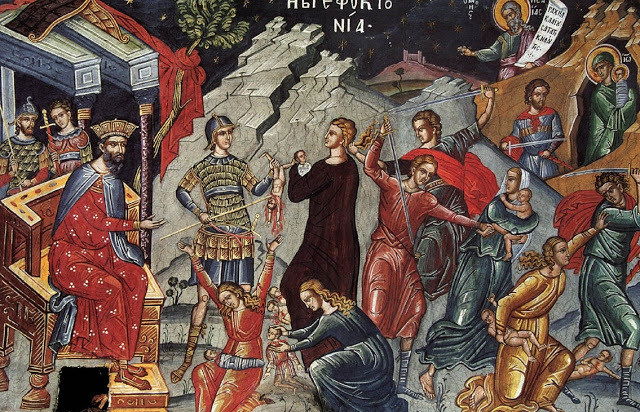 These three ritual elements are the only material sacrifice that has survived since the early Christian years. 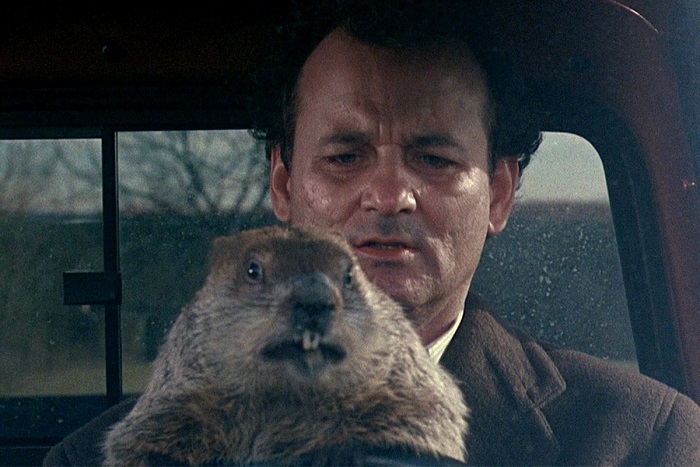 Its nature is symbolic. Its value is not measured by the materials offered, but by the pilgrim’s devoutness. In general, oil lamp lighting represents the light in their souls. The flame symbolizes the light of the Holy Spirit and the resplendence of all the Saints who are deep in the locals’ hearts. 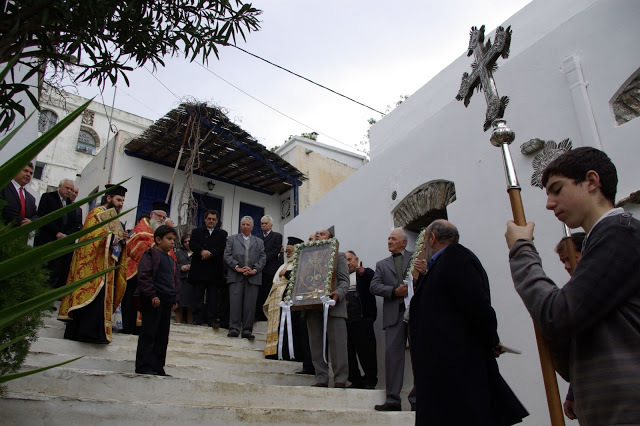 An old Christian custom, of monastic origin, is held during the Christmas season in Tripotamos. 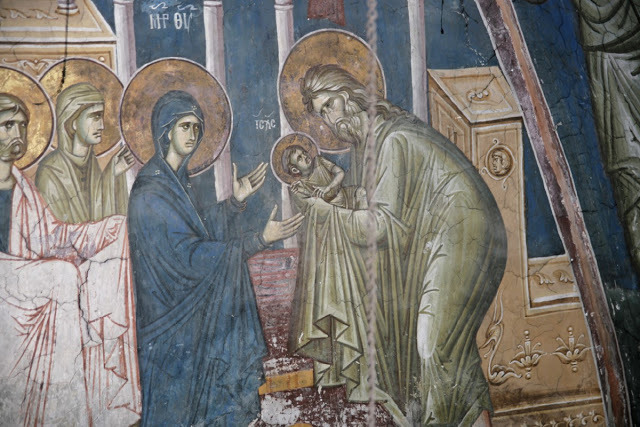 Every year, one family, whose leader receives the title of ‘Kavos’, takes on the responsibility of taking care of the village church, which is dedicated to the Presentation of the Virgin Mary. Among their responsibilities is to keep the oil lamp (vigil light) hanging over the Icon of the Nativity lit all year round. In addition, they keep the church clean, they pay the costs for the Christmas Divine Liturgy, the provision of candles, while they are also responsible for the making of a huge candle for the New Year’s Day Service. 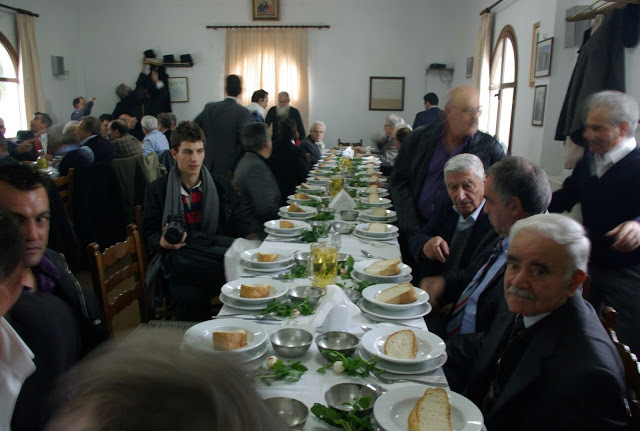 On Christmas day, at noon, the Kavos invites the priest and the men – the head of families of the village – for lunch. Each one of the guests has to bring his own fork, spoon, bread and wine, all wrapped in a napkin. The Kavos has to make provisions for a lavish meal, with soup, veal stew, and braised meat with tomato sauce, stuffed vine leaves and several other local specialties. Wine is served in goblets, special mugs of hemispherical shape made of brass that are used only on this occasion. After the meal, the priest and some of the table-companions carry the Icon of the Nativity from the church to their host’s house chanting Christmas hymns. The Icon is placed on the table, the priest hands out the holy bread, while everyone lights candles, similar to those used in the morning service. This is the moment when the priest appoints the next ‘Kavos’. 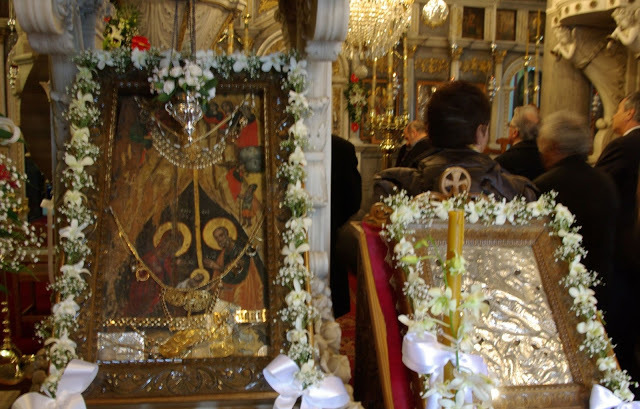 After eating the traditional sweets, the Icon is taken back to church while the crowd chants Christmas hymns. responsibilities of the former Kavos end with the Christmas meal. However, the oil lamp has to remain lit till the last day of the year. After Divine Liturgy on the 31st of December, there is a procession of the Icon around the houses of the village according to the custom of ‘podariko’ (=first visitor at a house on New Year’s Day is considered to bring good luck).